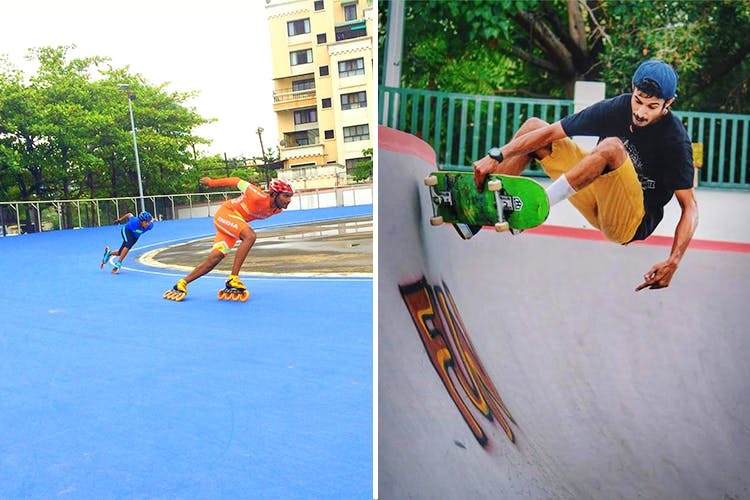 At par with international standards, this track opposite Symbiosis College in Viman Nagar is touted as one of the best skating rinks of India. Constructed in 2014 for a whopping 3.25 crore, the track's polymer coating enables speed skating and facilitates easy movement for beginners. Skating classes are conducted from Monday to Friday in the evenings and the place is often booked by schools, clubs for skating events. Fees start from INR 1500 per month. The skating rink at Toppers Sports Club in Pimple Saudagar provides excellent professional training to students and aspiring skating champs. Although, established in 2017, it has emerged as one of the most professional top-notch skating training academies. Taking a cue from American skateboarding rinks, this first-of-its-kind skate park at Navjeevan Society in Sahakarnagar is built by the city corporation the to encourage the sport. Currently, there are no trainers and the space functions on a 'self-learning' model. First-timers have to register with a mere INR 50 while the fees is INR 20 per hour. This skating rink on New India School ground in Kothrud is one of the oldest rinks holding skating classes in Pune. The place opens at 5 pm and holds regular training classes for roller skating and ice skating. The institute has played a vital role in promoting the sport at a grassroot level in Maharashtra. Situated at Parihaar Chowk in Aundh, this kid-friendly skating rink is operational in the evening post 6 pm. Regular classes are held here and trainers/ private skating tutors are available on request. Children learning here often participate in inter-school/ state skating competitions.